NEW YORK (AP) — The foundation at the center of the investment world is shaking. U.S. Treasury bonds are considered among the closest approximations to a “safe” investment in the financial system, which makes them a benchmark for most other investments. A pronounced move in Treasury prices ripples through to stock and bond markets around the world. Lately, those prices have been heading sharply lower, meaning the bonds’ yields have been spiking. The yield on the 10-year Treasury note climbed above 3.23 percent at one point on Wednesday, up from 3.05 percent last Tuesday, and is close to its highest level in seven years. A jump in yields tends to rattle investors, and the S&P 500 dropped 3.3 percent on Wednesday for its biggest loss since February — and clinched its first five-day losing streak since 2016. Among the hardest hit areas of the market were those that had earlier been the biggest winners, such as technology stocks. It’s the latest sign that markets may be struggling to adjust to a new era, where returns are no longer juiced by the ultra-low rates that prevailed in the years following the Great Recession. Going back even further, it’s another piece of evidence that the long run of declining interest rates, which began in the early 1980s, is over. The U.S. economy is doing well, and the Federal Reserve is raising short-term rates in response. Two weeks ago, the Fed raised its benchmark rate for the third time this year, and the federal funds rate now sits at a range of 2.00 percent to 2.25 percent. It had been anchored at virtually zero for seven years following the 2008 financial crisis. The Fed has less control over longer-term interest rates, which move mostly on expectations for future economic growth and inflation. Reports recently have shown that the job market and economy are strong. Inflation is still relatively tame but may be showing more signs of life. Investors have sold longer-term bonds accordingly. When a bond’s price falls, its yield rises, and the 30-year Treasury yield rose above 3.40 percent at one point Wednesday, up from 2.89 percent a year ago. WHAT DO RISING RATES MEAN FOR STOCKS? Higher rates generally hurt stock prices for a few reasons. One is that higher rates make it more expensive to borrow, which can tap the brakes on economic growth. Earlier this week, the International Monetary Fund downgraded its forecast for global economic growth, in part due to rising rates. Higher rates also erode profits for companies, which have to pay higher interest costs. As big U.S. companies give updates in the coming weeks on how much they earned during the summer, investors will listen as CEOs say how much of an impact they’re seeing from higher rates. Higher yields make bonds more attractive investments, which can siphon buyers away from stocks. When a bond is paying more in interest, investors aren’t as willing to pay high prices for stocks, which are riskier investments. 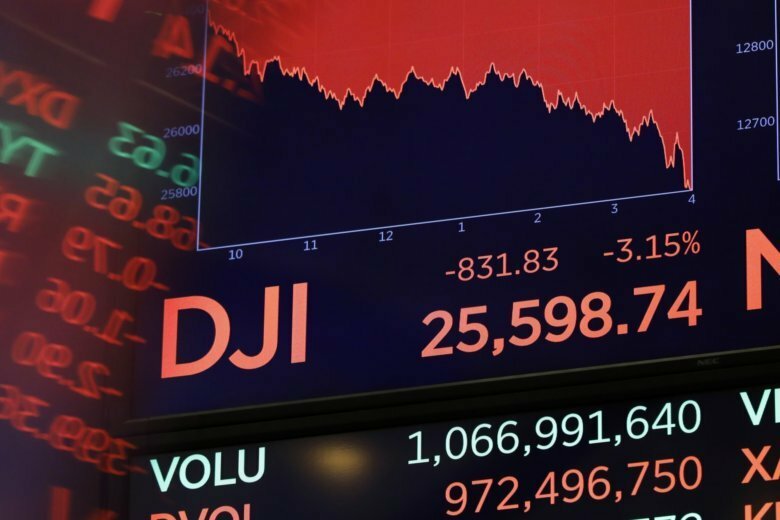 Some of the areas of the stock market that have been hit hardest this month are those trading at higher prices relative to their earnings, such as technology stocks. Apple plunged 4.6 percent on Wednesday, and Microsoft fell 5.4 percent, their worst days in nearly two-and-a-half years. WHAT DO RISING RATES MEAN FOR BOND INVESTMENTS? Bonds getting issued today are paying investors more handsomely than those issued a year ago. That’s good news for savers and investors looking for more income. But those bonds issued a year ago look less attractive in comparison. That means their resale price drops, something mutual funds and ETFs with such bonds in their portfolios must account for. Prices for long-term bonds are more sensitive to rises in rates than short-term ones, because they lock investors into a lower rate for a longer period. As a result, bond funds have logged losses recently, though generally milder than for stock funds. One of the largest bond funds, the iShares Core U.S. Aggregate Bond ETF, is down 0.9 percent since last Tuesday. A swoon in bond funds can be particularly unsettling for investors because they’re supposed to be the safe part of anyone’s portfolio, offering stability when stocks go on another of their stomach-churning runs. SHOULD I PANIC ABOUT RISING RATES? One measure of fear in the market is at its highest level since April. The VIX, which measures how much volatility investors expect from the S&P 500 over the next 30 days, was up more than 35 percent at one point on Wednesday. But if the recent rise in rates turns more gradual, markets could be better able to digest it. For bond funds, higher rates should mean more income in the long run, even though they’re knocking down prices at the moment. If rates rise slowly, that higher income could offset the price drops and leave investors with positive returns. For stocks, rates seem to be rising due to a strengthening economy, which should eventually feed through into corporate profits. That would help the case for holding onto stocks. The Federal Reserve has repeatedly pledged to raise rates only gradually. Last month it indicated it may raise rates in December for the fourth time this year, three times in 2019 and perhaps once in 2020. The biggest threat to stocks would be a burst of inflation that causes the Federal Reserve to sharply accelerate that timetable.